NES Gimmick! (JPN) in 05:11.49 by Aglar & Hotarubi. This joint venture between Aglar and Hotarubi improves the previous movie by nearly a whole minute thanks to a lot of new and refined tricks and shortcuts. 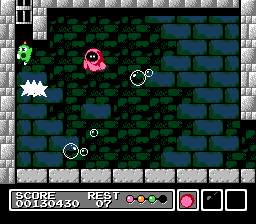 This run doesn't collect the special items required to access the 7th level, and thus gets a bad ending. However, we have another run that attains the best ending for your viewing pleasure!